We know that climate change is happening. We know that it could, if the worst predictions come true, destroy the conditions which make human life possible. Only one question is now worth asking: can it be stopped? In Heat, George Monbiot shows that it can. For the first time, he demonstrates that we can achieve the necessary cut – a 90% reduction in carbon emissions by 2030 – without bringing civilisation to an end. Combining his unique knowledge of campaigning and environmental science, he shows how we can transform our houses, our power and our transport systems. But he also shows that this can happen only with a massive programme of action which no government has yet been prepared to take. His exciting, disturbing ideas expose the cowardice of our politicians. By showing that we can save the biosphere without losing our comfort and security, Monbiot sweeps away their perpetual excuse for doing nothing: that it would be too painful and expensive to sustain life on earth. In every case, he supports his proposals with a rigorous investigation into what works, what doesn’t, how much it costs and what the problems might be. He wages war on bad ideas as energetically as he promotes good ones. He is not afraid to attack anyone – friend or foe – whose claims are false or whose figures have been fudged. 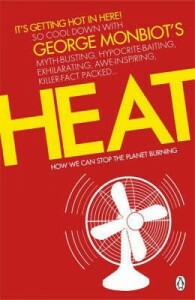 Heat also contains a breath-taking new exposure of the corporations trying to stop us from taking action. Inspiring, original, burning with energy, this book could change the world.